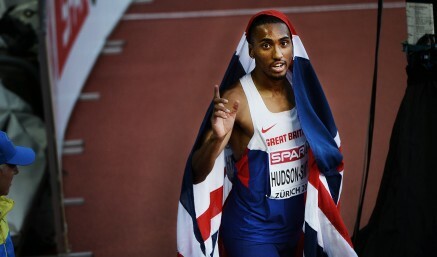 15th August 2014 – On another cold and wet night in Zurich Matthew Hudson-Smith (GBR) produced a brilliant run to take second place in the mens 400m final. Running in lane 6 Matthew slowly ate into the stagger and came into the home straight in medal contention. He continued to run strongly up the final 100m and only narrowly missed out for gold, finishing just 4/100ths of a second behind fellow countryman Martin Rooney. Matthew’s time of 44.75 was a new PB and the fastest time ever by a British 19 year old. Current World Champion Christine Ohuruogu (GBR) was not able to produce one of her famous championship performances on this occasion and finished fourth in the womens 400m final. Even so it was only just as she was given the same time as the bronze medal winner and was only 2/100ths behind the silver. There was disappointment for Dina Asher-Smith (GBR) who ran so brilliantly yesterday to make the womens 200m final. After making a very strong start Dina felt some discomfort in her hamstring and had to pull up. At only 18 years of age though Dina has many more championships to look forward to. Finally, Chris Tomlinson (GBR) used all of his championship experience to book a place in the mens long jump final. Sitting outside the qualifying places and with only one jump remaining Chris did not panic and produced a fine leap of 7.89m to progress.